Trying to append an immutable array (let) will not compile. Accessing a not existing index will produce a crash. Accessing an item of the dictionary returns an optional, because the result could be nil for a not existing key. 2…4 defines a range including the endpoints (2,3,4). However only classes have inheritance, introspection and casting. Structs and enums are value types. Classes are reference types. and are immutable when assigned using let. Note that function parameters are constants by default. Using var for a parameter creates a mutable copy. Any function which can mutate a struct or enum needs to marked with the keyword mutating. and are mutable when passed to a function, even if constant (let) pointers are used. Usually choose classes. Use structures for fundamental types and enumerations for data with discrete values. To override a method or property of the parent class mark them with the keyword override. To prevent subclasses from overriding add the keyword final. To define a type method add the keyword static or class respectively. To omit the external name use an underscore “_” instead – which is the default for the first parameter (but the init method). To force the same internal and external name for the first parameter use the hash sign e.g. “#internal“. For all other parameters the internal and external names are the same by default. Omitting (“_”) the external names for any but the first parameter is “anti-Swift”. You can observe the changes to any property using willSet and didSet where newValue and oldValue provide access to the the future or previous values. Properties marked with “lazy” only get initialized when they are accessed the first time. init methods are normally not used, if values can be set using defaults, they are optionals, they are initialized using closures, or by lazy initialization. and from a convenience init call a designated init of the same class (or at lease call it indirectly through another convenience init) before setting any property. If you do not implement any designated init, you inherit all of its parent designated inits. If you override all designated inits of the parent, you inherit all convenience inits. If you override no inits, you inherit all inits. Inits marked as required must be implemented by any sub class. Inits marked with a question or exclamation mark return optionals. This special protocols is primarily used for compatibility with existing Objective-C-based APIs. To cast AnyObject (or any other type) to a specific type us “as” or “as?“, or to check before casting “is“. A string is not an array of characters! Assertions are debugging aids to intentionally crash a program on certain conditions. When built for release, assertions are ignored completely. The lecture and its slides are available via iTunes named “4. 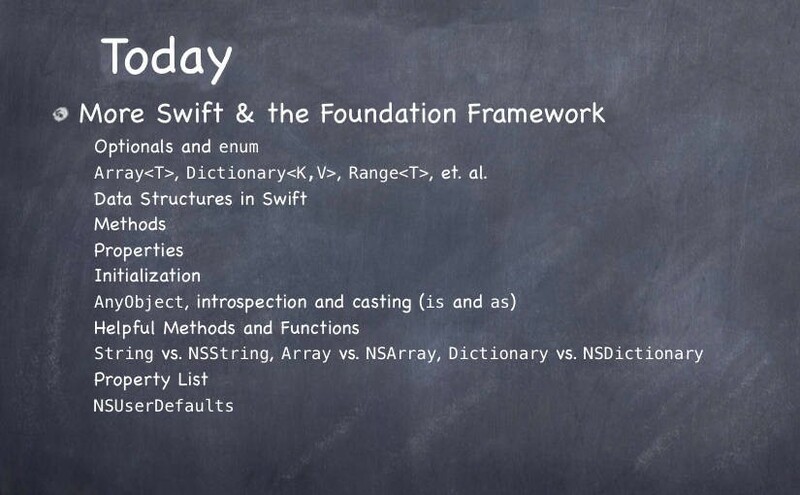 More Swift and Foundation Frameworks”.